Dynamical behavior of the turbulent channel flow separation induced by a wall-mounted two-dimensional bump is studied, with an emphasis on unsteadiness characteristics of vortical motions evolving in the separated flow. The present investigations are based on an experimental approach and Direct Numerical Simulation (Dns). The main interests are devoted to give further insight on mean flow properties, characteristic scales and physical mechanisms of low-frequencies unsteadiness. The study also aims to clarify the Reynolds number effects. 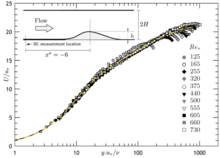 Results are presented for turbulent flows at moderate Reynolds-number $Re_\tau$ ranging from 125 to 730 where $Re_\tau$ is based on friction velocity and channel half-height. A large database of time-resolved two-dimensional Piv measurements is used to obtain the velocity distributions in a region covering the entire shear layer and the flow surrounding the bump. An examination of both high resolved velocity and wall-shear stress measurements showed that for moderate Reynolds numbers, a separated region exists until a critical value. Under this conditions, a thin region of reverse flow is formed above the bump and a large-scale vortical activity is clearly observed and analyzed. Three distinct self-sustained oscillations are identified in the separated zone. The investigation showed that the flow exhibits the shear-layer instability and vortex-shedding type instability of the bubble. A low-frequency self-sustained oscillation associated with a flapping phenomenon is also identified. The experimental results are further emphasized using post-processed data from Direct Numerical Simulations, such as flow statistics and Dynamic Mode Decomposition. Physical mechanisms associated with observed self-sustained oscillations are then suggested and results are discussed in the light of instabilities observed in a laminar regime for the same flow configuration.